SAN FRANCISCO, Calif. - 25 July, 2007 Telstar Logistics Genetics Systems, working in collaboration with the Biological Imperative Group and Evolutionary Solutions Inc., is proud to announce the successful launch and deployment of our newest brand extension, Miel Avril Lappin. 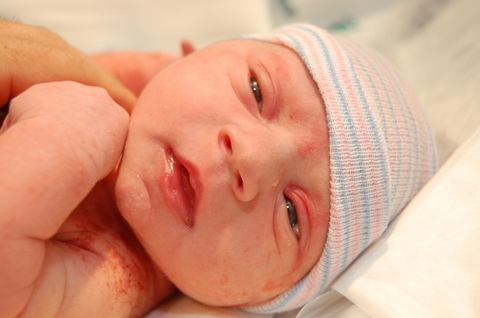 Miel achieved re-entry at 4:54 pm on July 24, 2007 in San Francisco after a mercifully brief and uneventful labor. Her gross delivery weight was 7 pounds 1 ounce (3177 grams), with a total platform length of 19.5 inches (49.5 cm). A state-of-the-art newborn, Miel is equipped with the latest onboard diagnostic and maintenance technologies, including fully autonomic respiratory, circulatory, and waste-disposal systems, as well as pre-installed grasping and suckling subroutines. A built-in acoustic alarm alerts the executive team when ambient conditions are sub-optimal, and the user interface is calibrated for maximum cuteness. After rigorous third-party testing, Miel also achieved the prestigious Apgar 10 certification for superior build-quality. "Adopting a standardized infant platform that supports heterogeneous brand propagation enables Telstar Logistics to improve long-term connectivity and increase overall performance levels," said Todd Lappin, co-chair of Telstar Logistics Genetics Systems. "In the years ahead, we anticipate that Miel will help expand our conceptual footprint among the much sought-after Generation Z demographic." Miel said, "Wehhhhhhh pfthhhhhhp-p-pt fwptttthhhhhhht gug-g-g-g-g." Her mother is doing very well, and trying to get some sleep. Telstar Logistics is a leading provider of integrated services via Land, Air, Sea, and Space. For more information about Telstar Logistics, its products, and its history, please visit our Investor Relations page. Day Six. Trajectory and telemetry are still good. Returned to Telstar Logistics headquarters for permanent basing. Cuteness increasing, in tandem with sudden interest in social activism. Congratulations on a successful merger and spinoff. While the fiscal ROI on such spinoffs has been reported to be less than 1, the ancillary benefits and temporal brand extension are cited often in the literature as creating a net positive effect. Yeah, that's pretty much what the analysts down in Finance said. In the end, the HR and Marketing teams really carried the day. Great news! As a potential investor I am very reassured to see that Telstar Logistics is planning for future administrations. It gives me confidence that an investment in Telstar is an investment that will last. As the above comments eloquently attest, Telstar Logistics has done it again, in perfect corporate-speak. Three chears for my favorate CEO and his multi-talented CEOess. Note: the above message was misattributed to Devin. With apologies to him, I am it's author. Congratulations! I believe a chocolate cigar wrapped in pink paper is requisite under these circumstances? It might be time for Telstar Logistics to make the leap towards a state-of-the-art surveillence system. Another quality product, delivered on time and under budget! A textbook launch of a new product. Someday you'll have to write up a Harvad Business School casestudy of how you did it. Classic! Nice branding of the name, too. I notice her name already gives you 60 Google hits! Good work, Telstar! Who knew you had these expansion plans? News travels slowly to the hinterlands. Congratulations! Congratulations on the expansion, and also, well done on keeping the job in the USA and done by American workers, instead of outsourcing it to India or China, merely to save a few dollars. It's this devotion to The American Way that has made Telstar Logistics the growing excited corporation that it is today! An Apgar of TEN?? I would like to buy shares. Our many congratulations on an awesome birth! I find it troubling that you say nothing about ISO 9001 certification. Prepare to meet the wrath of the shareholders. ... and the so-called experts claimed that Telstar Logistics couldn't pull it off! one small step for man, one giant step for Miel - bravo!! !